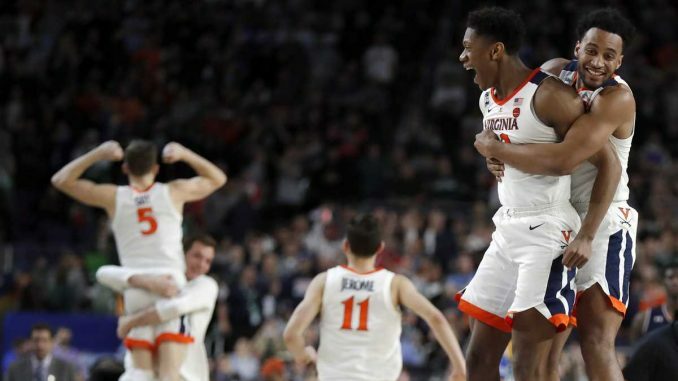 As March Madness came to a close, there were certainly a few surprises on the last weekend of the tournament, including a controversial call in the final seconds of Virginia’s victory over Auburn. The fifth-seeded Tigers were down by ten with under five minutes left in their Final Four matchup, but Auburn mounted a comeback, scoring 14 straight points, and took the lead over Virginia. After a five minute drought, Kyle Guy brought the Cavaliers within one point as he made an off-balance three-pointer with seven seconds left. The main controversy came into play when Virginia got the ball back with just seconds to spare. The officials missed a double dribble with 1.5 seconds left on the clock and Virginia then got the ball back to Guy for one last shot attempt over Tigers guard Samir Doughty. This time, however, Guy’s three-pointer fell short. As Auburn began to celebrate what they thought was a victory, officials gathered and the replay showed Doughty colliding with Guy while he released his shot. A foul was called and Guy was then sent to the free throw line. Guy, who shoots 81.8 percent from the charity stripe, made all three of his free throws and sent Virginia to the title game. Later that night, Michigan State took on Texas Tech as the two teams fought for a chance to play against Virginia on Monday. The Spartans were the only team remaining with recent Final Four experience. Texas Tech and Auburn had never reached the tournament’s final weekend before, and Virginia had not been since 1984. When the game tipped off the Red Raiders struggled offensively as their best player, Jarrett Culver, couldn’t find the bottom of the net. They also had a key player go down with an injury. Tariq Owens had to be helped off the court after hurting his ankle. Texas Tech leaned on their defense and the shooting of guard Matt Mooney, who ended the night with 22 points. Late in the game Culver came in clutch, leading Texas Tech on a run that would seal their victory. “Very seldom in my career have we been kind of out-beat up,” said Michigan State coach Tom Izzo. “Tonight was one of those nights.” In a physical battle the Red Raiders were able to hold the Spartans to just 31.9 percent shooting from the field. On monday night, for the first time in 40 years, the NCAA men’s title game was between two teams that had never been there before. Texas Tech faced Virginia in a game that started slow. Five minutes in the score was just 3-2 in favor of the Red Raiders. Defense played a big role until the two teams eventually began trading shot for shot. “Every time I thought we had it, they made a shot or made a play,” said Mooney. “It was a battle. We threw a punch, they threw a punch. They came right back at us every time.” After hitting two free throws, Norense Odiase had Texas Tech exactly where they wanted to be, ahead by three with just 22 seconds left. If the Red Raiders’ top ranked defense could hold off Virginia they would be champions. “We pride ourselves on getting stops like that,” Odiase said, “I thought it was over.” With just 12 seconds left, De’Andre Hunter knocked down a game tying three-pointer and the two teams went to overtime. Virginia and Texas Tech battled each other throughout the extra period until Hunter hit another three pointer, this time putting his team ahead with just over two minutes left. From that moment on, Virginia never gave up the lead and the Cavaliers went on to win 85-77.